I'm having exactly the same problem. It happens every weekday between 6pm and midnight. I've spoken to the technical dept and they keep saying to plug my lead into the master socket but I don't have one as mine is a perminant master socket with built in filters. My conclusion is they are slowing it down at peak times. My only option is to cancel as they promised me 32Ggs minimum on a 72 GBS line. Thanks for getting in touch with us @nuggies5. It's weird seeing the pattern of your speeds like that. I'd like to look further into this. Please see the private message that i've just sent to you and follow the instructions on how to contact our team directly. Glad it’s not just me. This issue has been dogging me for weeks now. 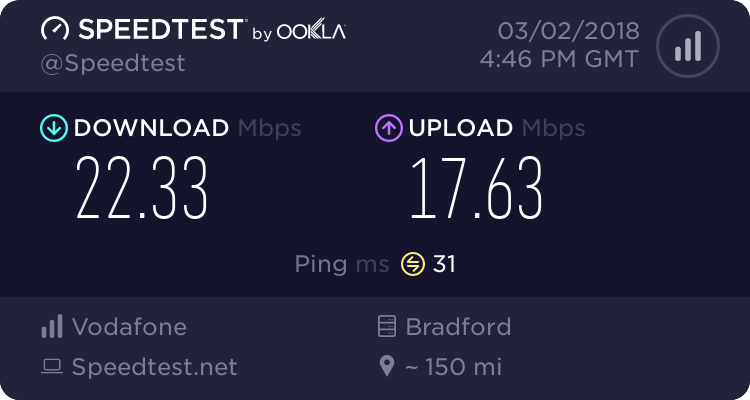 Great ping and speeds up until about 5pm and then all of a sudden my speeds crash and my ping is through the roof. My ping has been as high 500ms, so online gaming? Forget it! Recently, the speeds I’ve been getting have even made streaming from the likes of Netflix and Sky Go impossible. Tech support are useless. I was promised a message from the tech team 72 hours after reporting the issues over a week ago...I’m still waiting. Ive given up the ghost now and signed up with BT. 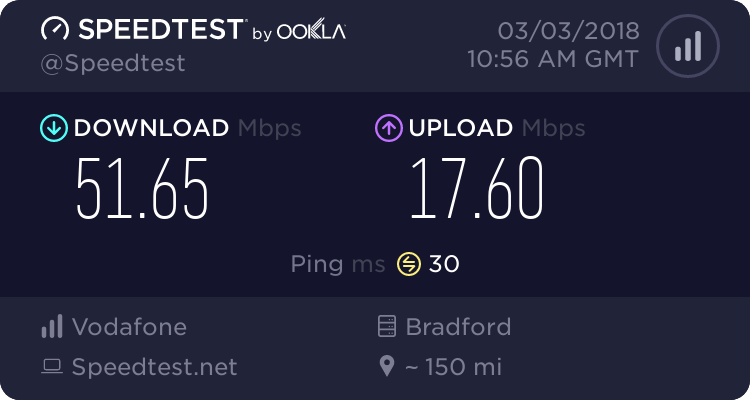 They current have an offer on paying up your cancellation fees of up to £300 - not that that would stop me, I’d pay £300 just to be able to have a router that doesn’t constant drop connection, and receive consisten speeds that allow me to stream services that I pay an awful lot of money for. Check out the difference in these two Speedtests from different times yesterday - see if you can guess which one was done before 6pm! Sorry, photos don’t seem to have attached...probably my shoddy internet! BT will pay your cancellation fees to switch (up to £300). i went through live chat with bt and they’ve confirmed the offer is live. I jumped ship immediately...not sir ding one more minute than necessary with this bunch of cowboys! My speeds have always slowed down over time, even after sending 5 engineers out they can't find the problem. Everyone say there is an issue as the line test at 98mbs (limited to 80) but over a few weeks it goes down to mid 50s. Over the last few days broadband has been diabolical down to 3mbs even tought synced ay 57. Tonight is really crap again, and I'm fully wired with etehernet cable not using wifi at all. Same here, last night it was terrible. This morning all is back to normal but I'm worried it will happen again each night. I have used the bt cancellation fee before, i also used the Vodafone one as I left bt a month early so had fees that Voda paid. 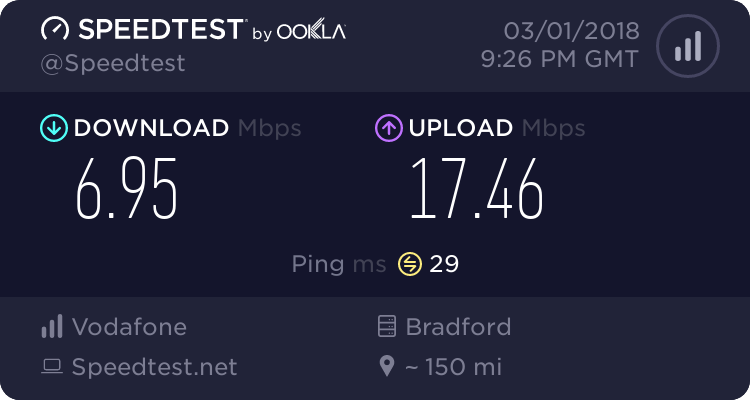 Vodaphone rang me at weekend,was told to supply speedtests ,which i have ,but miracously my speed has returned to what they should be,dont know if they have done something there end or not. will keep monitoring all the same.